Caveat Emptor. Let The Buyer Beware. Valuable words for anyone to heed but beware of what? Sometimes you have to beware of the product or service and sometimes you have to beware of the provider and sometimes you have to beware of both. Why am I talking about this now? Because there is another scammer on the loose that binary options traders need to be aware of and beware of. 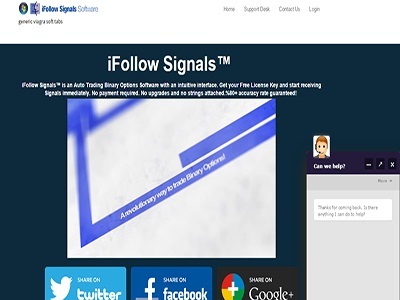 This is iFollow Signals.com. This new website is a new provider of free binary options software that sends signals directly to you in a variety of ways. The system uses a proprietary and intuitive interface that is capable of providing you with +/-80% accuracy. The best thing about this new service, and one of the very first things you will learn about it, is that it is free. Totally, 100%, no payment required, no strings attached free. I should have put quotations around the “no strings attached” part because that is what they say. No strings attached. In previous articles I have expounded on what free really means so I won’t do that here but just to touch base many standard definitions of free include phrasing very similar to “no strings attached”. The only thing you have to is provide a valid email address in order to receive a license key for the software. Once you are confirmed you will then be able to start using the software and receiving signals immediately. Don’t worry though, they say they value your privacy and you know you can always trust what you read on the internet. What exactly is iFollow Signals? It is a software package providing algorithmic binary options trading signals. It only takes three simple steps to use, according to the web site. Simply download, activate and start trading. It’s that simple. The signals come through on their proprietary delivery system. They developed this system because emails can slow you down and cause inefficiencies in trading. Their “intergrated” system delivers signals right to you in 40 milliseconds. As for performance they claim a success rate of +80%. This is pretty good and not to wild a claim to believe but when reading into their claims I found my first clue and warning sign that not all was it seemed. In order to test their claims and gain access to what are supposedly objective reviews and opinions you get a free licence key just like they said, for only 30 days. That’s right folks, just like I suspected, free isn’t really free and there certainly appears to be at least one string attached. This is troubling to me because they clearly said at the first there were no strings attached. As for their mission statement, the desire to operate with integrity to provide transparent operations and accurate signals. The bait and switch tactics demonstrated here do little to provide transparency or evidence of integrity. As for the accuracy of their signals how can you even begin to trust them? The final blow for this SSP, the last nail in the coffin for them so to speak, is what I found at the very bottom of the page. Not only is the service not free, not only are they misleading traders into their web, they are also an affiliate marketing scam! You have to join through one of their trusted brokers in order to get your codes and activate the service. It doesn’t matter that some the brokers they recommend are OK, if they make you sign up and fund an account it means they are making money from you and the service is definitely not free. Oh, and if you already have an account you can just go ahead and buy it. I actually do follow some signals but I won’t be using this provider. The best signals, tips and trading advice can always be found in a binary options forum like the one here on BONET. Forums are fantastic places to find other people who are actually trading binary and doing it successfully. If you are worried of being scammed through a forum don’t be. Believe it or not it is almost as easy to detect BS through a chat room as it is in person. All you have to do is ask yourself this one question, is the person actually helping me or is he/she trying to get me to deposit, fund or buy anything? True help will be helpful and won’t come with any strings. I did find one thing of value while checking out this website, a quote from Ben Franklin that is as true now as it was 250 years ago. “An investment in knowledge pays the best dividend”.